Until I started Weight Watchers, I thought Quark was just an old skool page layout program. Or a particle. Turns out it’s a cheese that’s approximately half as disgusting as cottage cheese, which makes it pretty edible when you’re looking for lower-fat cheese alternatives. I’ve been craving pasta like crazy since I’ve been following the weight watchers plan and whilst I can totally still have pasta (perhaps not my favourite mega-bowl of pasta shells and pesto), it just feels like such a damn waste of points. Have you ever weighed pasta? It’s surprisingly heavy. You need to play that pasta at its own sneaky game and get clever. Instead of spirals, bows and shells – opt for lasagne sheets and cannelloni tubes – you can construct a hefty portion of your favourite pasta dish without feeling short-changed just by making this simple substitution. 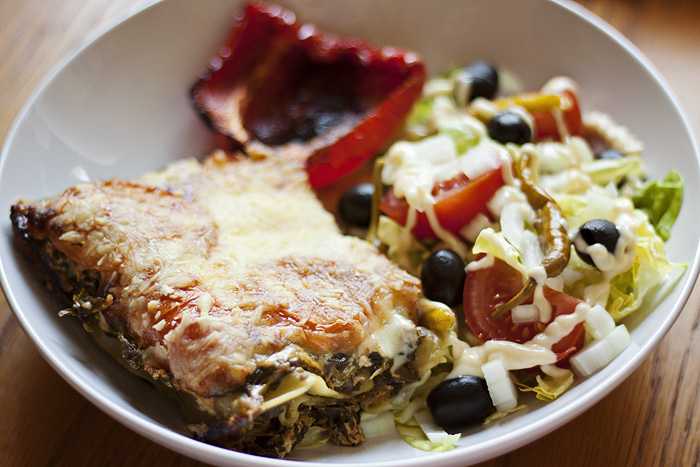 On the menu last night was this, Spinach & Quark (just pretend it’s ricotta) Lasagne. My husband hates fresh Spinach but he tolerates (and secretly enjoys) the frozen stuff. I don’t understand why, but I figure that it means at least I don’t have to wash the leaves. Pick your battles. Finely slice the garlic and defrost the spinach in the microwave, retaining any excess water (if you’re stuffing cannelloni tubes with the mixture, drain the water). Stir in the Quark, Smoked Paprika and garlic until well-combined. Grab a shallow dish and spoon 1/3 of the spinach mixture on the bottom. Layer the lasagne sheets ontop and repeat the process. I usually get two layers of pasta and three layers of spinach from the above quantities but your mileage will obviously vary depending on the size of your dish! Top the final layer of spinach with the sliced tomato and sprinkle with the grated cheese. Cook in a pre-heated (190 degrees celsius) oven for around 30 minutes or until the cheese begins to brown. We had a red pepper looking a bit wrinkly in the fridge, so I halved it and sprinkled with balsamic vinegar before popping it in the oven alongside the lasange for around 25 minutes. Serve with a side salad. 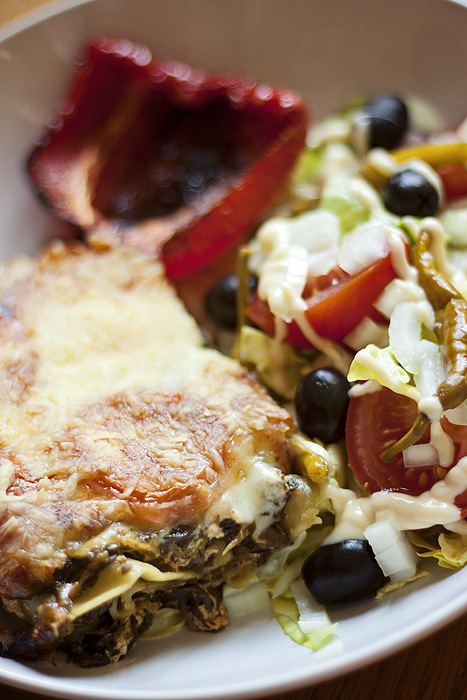 9 Weight Watchers Pro Points for a super-cheesy, easy-peasy lasagne. Do you buy Quark? What are your favourite recipes with it? Oh fair play, restarted weight watchers a few weeks ago as I kept cheating on my regular diet! This looks yummy! Quark is great! I’m on Slimming World and I like to mix a couple of tablespoons of it with a tablespoon of artificial sweetener and a teaspoon of Bourneville cocoa powder (1/2 a syn on Slimming World). Spread it on Ryvita for a cheeky chocolate cheesecake imitation. Obviously never as wonderful as the real thing but a decent substitute. Lovely! I’ve been craving lasagna myself lately. Love that it’s 2 servings as well! Looks yummy! Did you enjoy it? ELLE Celebrate their 25th Anniversary with Mavala! New No7 Spring Collection launching next week!